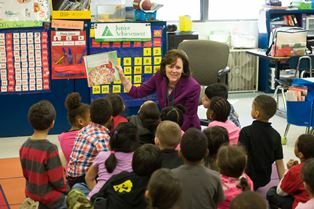 Barbara Cottam, Rhode Island Market Executive at Citizens Bank, reads to kindergarten students as part of JA Leaders Day at George J. West Elementary School. Sue Carmody, Senior Vice President/Head of Core Banking Sourcing at Citizens Bank and Chairman of the Junior Achievement Board of Directors, with her 4th grade JA Our Region students. 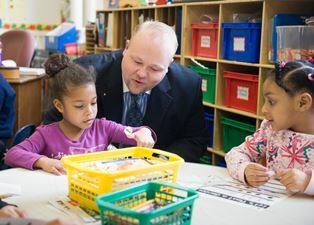 Lee Lewis, President of Junior Achievement of Rhode Island, with students from his kindergarten JA Ourselves class.